The Scanner is innovative, space saving, portable and easy to use. Well Done !! I have been very impressed with this scanner. It actually does what it says it will do! It's easy to set up and use, very quick and very efficient. I'ts very portable and light. I'd recommend it for anyone like me who has to scan a variety of documents in often difficult locations. Firstly your service & assistance is second to none. Your level of customer service has been outstanding in terms of advice, recommendations and support. I use the Fujitsu ScanSnap S1300 with my iMac and it has been a simple plug & play product. The speed of scanning is great, it can determine whether or not to scan one or both sides of an item automatically. It produces an excellent pdf copy that has auto-straightening of the image in case of the sheet is not fed very accurately. 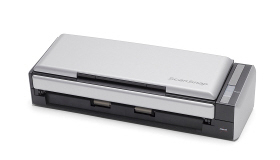 At nearly half the size, the ScanSnap S1300 is designed to be the smallest Fujitsu multi-page duplex scanner for one-button ease of use at the desk or on the road. Just press the "SCAN" button and the 10 page automatic document feeder scans both sides of each page at up to 8 pages per minute. The S1300 automatically recognizes the size of each document, detects and corrects for skew, and shows images in their proper orientation with blank pages removed. With ScanSnap, operators can remain connected with their scanned documents. The ScanSnap S1300 can automatically convert scanned data into searchable PDF files at the touch of a button. Users can also use a colored highlighter pen on a black & white document to create searchable keywords automatically. For added mobile convenience, the Fujitsu ScanSnap S1300 can be powered though the PC's USB port* when an AC power source is not available. *When using the USB bus power cable, the PC must have two USB ports; one for power feeding and the other for USB cable connection. * Rack2-Filer is provided as a 30-day trial only with this product. For full license version, see S1300 Deluxe Bundle (Part: PA03603-B015).